Receipts are used in many businesses in different industries. They are very useful in recording details of business transactions, such as in sale and purchase business. They are also kept as important documents for tracking progress in profit and other accounting related things. It’s amazing how this small piece of paper can help and benefit small and large businesses alike. 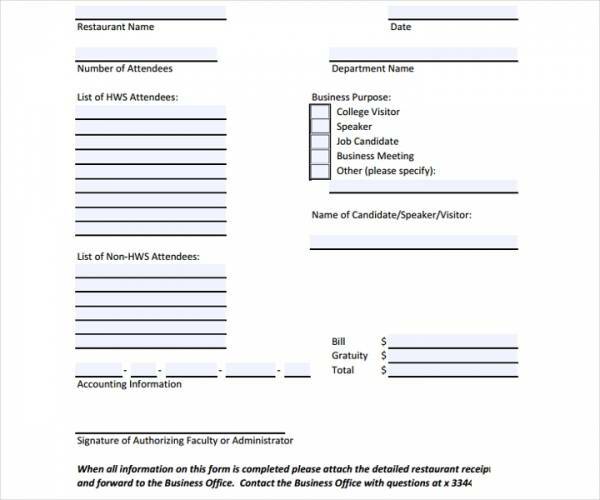 We have here sample bill receipt templates, specifically restaurant bill receipt templates that you may download and use as reference as we cover topics related to it. 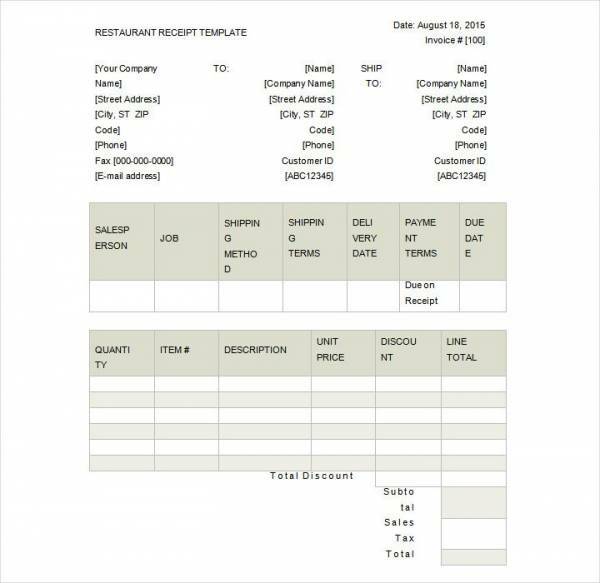 We will define what a restaurant bill template is, identify the types of receipts, and how to make one. Check them out below! 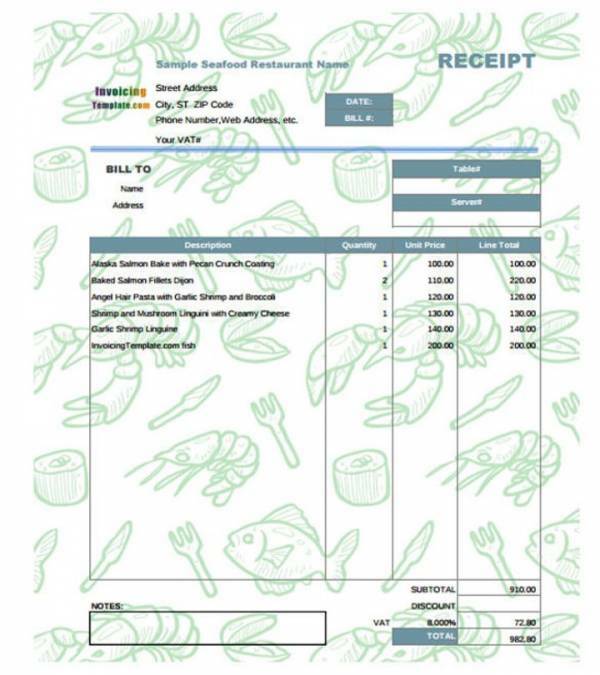 What Is a Restaurant Bill Receipt Template? Have you noticed that piece of paper placed in the center of the table on some form of holder? That piece of paper is a restaurant bill receipt. This receipt is where all of your orders are written, specifically those that you have already received or the food that has already been served. This receipt is often just plainly handwritten, but now there are restaurant bill receipt templates that come in checklist form where check boxes are marked for orders that have been served. Restaurant bill receipt is defined as a formal acknowledgement that a person or individual has already received the specific products they have ordered. The receipt often comes with total expense of the entire order. 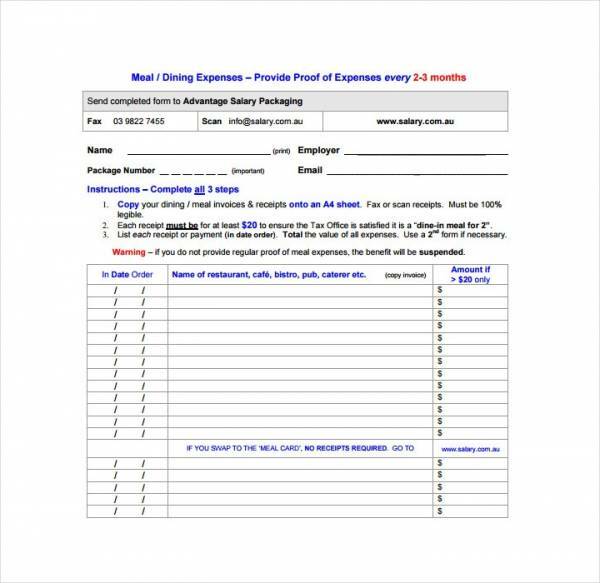 Restaurant bill receipt templates are templates specifically made to make the ordering process easier and more convenient for both the customer and the order taker. 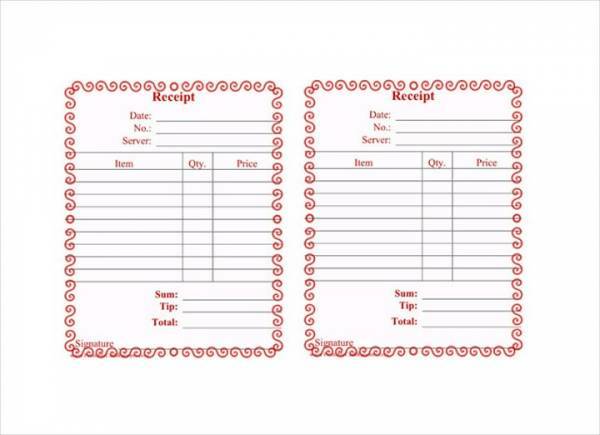 It is a ready-made document that contains all of the details necessary to take orders quickly, like the menu that the restaurant offers or a space where orders can be written clearly. 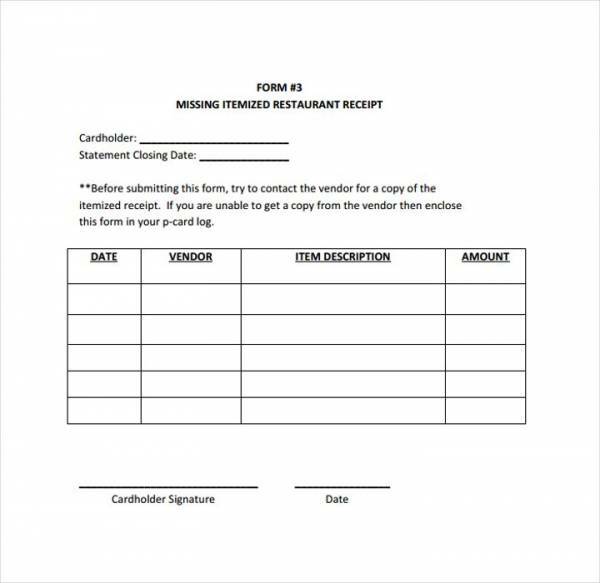 Restaurant bill receipts are used in writing down or recording customer orders in detail so that when the receipt is passed on to the kitchen, the chefs will know exactly what orders to prepare and how many orders they need to prepare. Since a restaurant bill receipt is where customer orders are recorded, it is also where the total amount to be paid for the ordered food is written. The breakdown of the taxes, the services charges and other related fees are included in a restaurant bill receipt and these details are very useful when preparing a number of business financial statements. 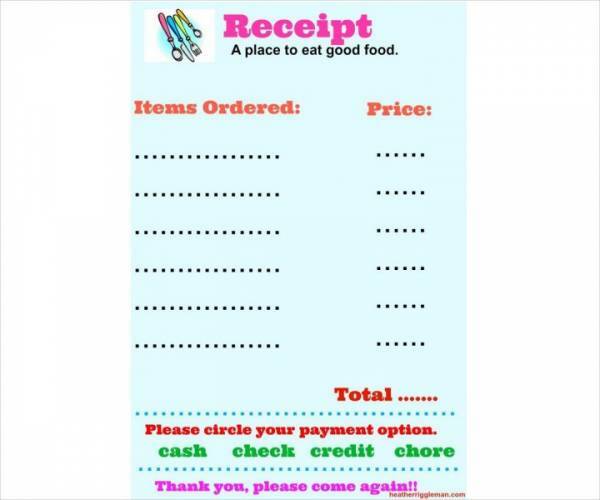 Restaurant bill receipts are used to formally and politely request for payment for the goods and services that a customer has consumed. When it comes to audits, restaurant bill receipts can back you up with your return claims as the records will show that what you are claiming is right and legal. What would a restaurant do without a bill receipt. Well, they’re probably not a registered business who are permitted to do business. 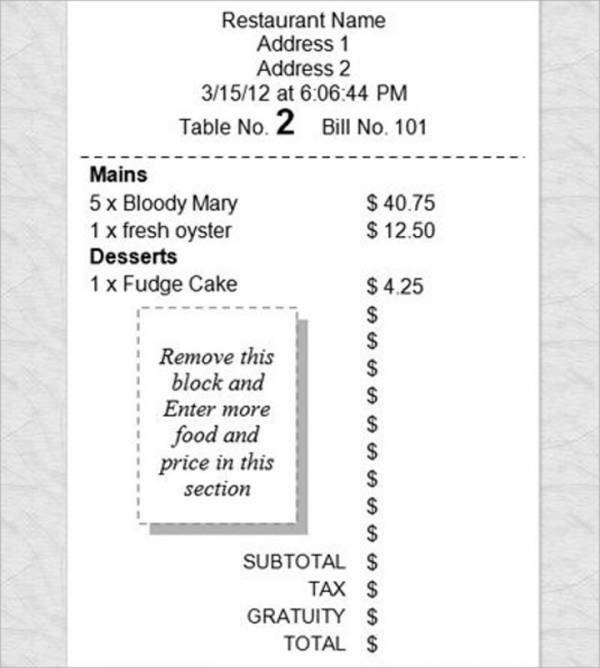 A restaurant bill receipt is not only useful but it is also a convenient tool to use in a restaurant business. Other related topics you may find useful are Restaurant Receipt Templates, Blank Sales Receipt Template, and Transfer Receipt Templates. A lot of things have evolved from one thing into something more useful and more convenient to use, and receipts are no exception. Through the passing of time and with technological advancement, the way we make and use receipts has evolved and that is why there are now many different kinds of receipts in existence. These receipts are divided into three which are the three main types of receipts. These are the receipts that the cashier at the counter issues right after we make the payment for our purchases. Printed receipts are often characterized as small rectangular sheet of paper where all the details of one’s purchase is listed. The details include, an itemized list of all products, their unit price, quantity, total price per item, total amount to be paid, taxes and fees and many more. It is convenient to have printed receipts when keeping track of one’s budget and expenses as they are available whenever you need them. You don’t need any equipment or any form of device. The downsides are they are printed on thermal papers, so they will lose the print after about some time. Another disadvantage is that, they are printed in small papers that can be easily misplaced. And here you are thinking that all receipts are printed. Well, not quite although a lot of receipts are indeed printed. If you do not know yet, there is such a thing as digital receipts? So what are these receipts? These receipts are the type that are sent to the recipients email address. Just like printed receipts, they have all the necessary details as well as an itemized list of the products or services that the customer has purchased. Digital receipts are most common with online shopping, with companies who have suppliers from other countries and with transactions that involves large quantities. Digital receipts rose to popularity when people became conscious and aware of environmental conservation. Through digital receipts and paperless billing, companies use less paper which means less trash and more tress are saved. Most businesses also see it as a way to save extra on paper resources and so opting for a paper bill will cost them around $2 per copy. Well, if you opt in for paperless or digital receipts you’ll be able to save more in the long run. Before printed receipts became the norm, handwritten receipts where the primary means of creating and issuing receipts. What are handwritten receipts. These receipts use a standard or general receipt template that has lines and tables where the purchase details are handwritten. And when we say details, they are the same details that you can find in a printed receipt and a digital receipt. Sounds like a lot of work, right? Well, not quite because long before receipt templates were available, that was the time before the printing press existed, everything in a receipt is handwritten. Just imagine how much hard work is needed if a couple of customers buy 20 to 30 different items in one transaction. Handwritten receipts still exist today although they are not as common as they were before. Some new shops use them because they find it convenient and still other old shops use it for various reasons. So, it’s not taboo to use them in the present. It’s quite interesting to know about these three types of receipts. You definitely have more than one option and that is truly an advantage. There are also no required situations or businesses where every receipt must be used on. Everything is up to your preference. You can visit our website to check out more related articles, like Bill Receipt Samples and Templates, Gift Receipt Templates, and Credit Card Receipt Templates. How to Create a Receipt Template? Creating a receipt template is pretty easy. There are a lot of ways for you to choose from and the steps below is one of them. Start with looking for a receipt sample or a receipt template that you can use as your guide or as reference. You can use this to check on what parts you are missing or where to position certain contents. Then choose the device application that you want to use to create your receipt template. Make sure that it is one supported by your printing device and that you find it convenient and easy to use. 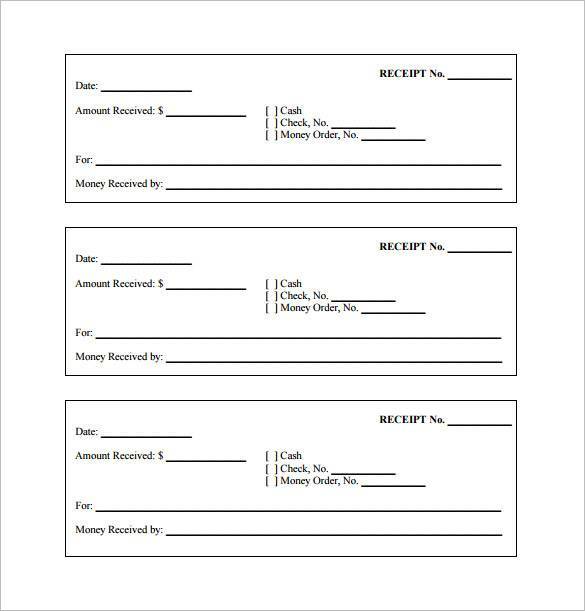 Also create an outline of how you want your receipt to look like, especially some details that you want to change the position. To get started, prepare the things that you need like the device you will use, your outline as well as the samples and templates. Launch the device application of your choice and choose a blank sheet or document. Start working on setting the paper size, the paper orientation, margin, indentation, fonts and so on. 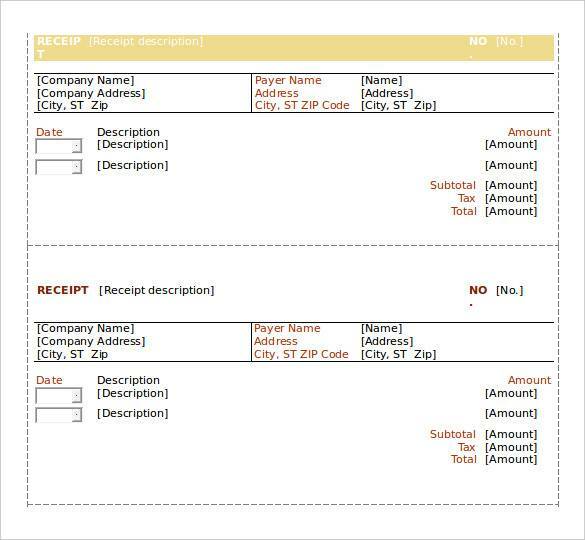 Then with the outline you just created, start entering the details of your receipt template. Don’t forget that you have samples and templates that you can use as reference. When you have everything entered, review your work and check for any missing parts or components. Make revisions as necessary. If you are satisfied with your work, go ahead and have it saved in your preferred folder with your preferred fine name. Make sure that you remember where you saved it and the file name you created for it. After saving, look for the file in the folder where you had it saved and then have it opened. If it opens successfully then you are done with it. 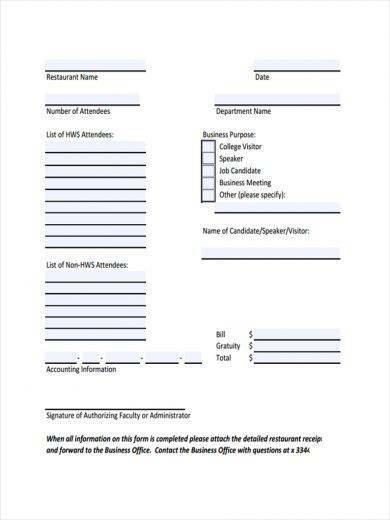 You can now use it and print copies. A receipt template is such a convenient tool to have and use because you can have it printed as many times you want and need to. You can also save a lot of time if you use a template. Nothing is more rewarding than creating and using the template that you made yourself. If you need more templates, just check them out on our website. We have there Payment Receipt Templates, Store Receipt Templates, and Purchase Receipt Templates that you will surely find useful.